This can be a lot of fun! Rope in family, friends, colleagues or peers to help you organise anything from a pub quiz, coffee morning, raffle right through to running a marathon! Whatever you decide to do, we’ll be on hand to help us you raise as much money as possible. We have also produced two forms where you can put forward your proposal to support us – and we’ll be happy to support you and give you all the help you need. Paces organises a range of events every year that you can take part in; recently ten runners ran the Yorkshire Half Marathon for Paces; we can organise places at events on your behalf. For more details of our calendar of events please contact the fundraising team on 0114 2844488 or see our Whats on page. You can create your own fundraising page using our website please visit our Donate page and click on Fundraise. 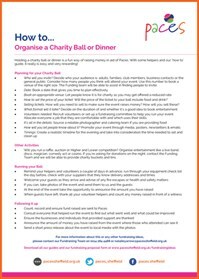 This could be stand-alone, or linked to a fundraising event or activity that you or we have organised. Your business can help us in several ways. Perhaps you could sponsor our family support team or our outreach programme, start a matched giving or payroll giving scheme, organise an event or encourage your staff to get involved in fundraising activities. Many companies like to support Paces to highlight their commitment to charity and the community; You’ll be supporting children, adults and their families as well as raising your company’s profile. Contact us today to discuss how we could work in partnership. We have several long-standing relationships with charitable trusts and foundations, and we’re grateful for their continued support. The income we receive from them makes a huge difference to our work. If you’re a Trustee and you’d like to help Paces, please contact us for more information. Please follow this link to see a list of our supporters in the last 12 months. Leave us a legacy in your will and you’ll be giving a gift to children, adults and their families that benefit our support now and in the future. Please contact us for further details about Legacy Giving. Charity Champions are individuals who help to motivate and engage others in fundraising and awareness raising. We’re always looking for volunteers to help us with our collections, or to help us be the selected charity for many local companies, these partnerships have raised valuable funds for us. For more details about being a Charity Champion please contact us. We also have vacancies in the fundraising team to get involved in administration, marketing, events organising and bid writing. If you would like to know more please Contact us. If choosing to make a donation, please remember to tick the box for Gift Aid if you are a UK tax payer. By doing so, you will generate a further 25% payment on top of the original donation. Contact us with your fundraising ideas and the funding team will assist where necessary by promoting the event, proving sponsorship forms, supplying extra pairs of hands etc.